Congratulations on your engagement! I would like to welcome you to Rusty Bowers Entertainment, and to tell you first of all that it is an honor and a privilege to help you create an unforgettable, fun, and unique Wedding Reception that truly reflects your style and personality. I take that privilege seriously, and promise to make the entire process stress-free and exciting! In The Success Of The Entire Reception! I understand that for most people, choosing a DJ is often difficult and confusing, yet the most important decision you will make for your wedding reception. Since everyone claims to be "the best", how can you really find out who is good, and who is amateur? For a once in a lifetime event like a wedding reception, you best start with a professional. Don't take chances with "a friend of a friend". Although people mean well, lack of experience or skill will not prepare them to handle unexpected details. First I recommend you start with a wedding specialist. 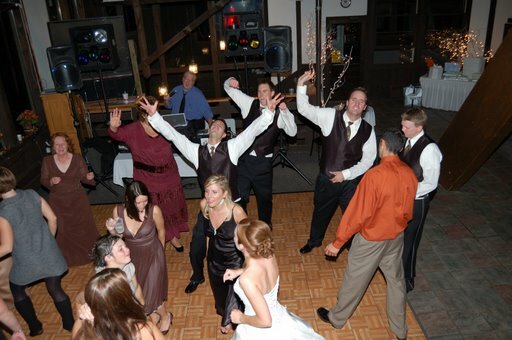 A DJ from a club or school dance may be great, but they're not necessarily right for your wedding. Second, meet with the DJ Company. This is not a decision that can be made over the phone. You must be sure you are comfortable with the DJ's style and see if it is a good match for you. After all, they will be representing you at your wedding reception. Then, check the history and background of the DJ Company. Do they have references? And don't just take their word for it, call the banquets facilities, call several of their references and find out WHY the client loved their DJ. Don't make the mistake of choosing a DJ by price alone. If the DJ is not a good fit, but the right price, it won't matter a bit if he ruins your special day that you spent big money and many months planning. Since the DJ you hire will bear the responsibility of over 80% of the success of your wedding reception, it is easy to see how important it is to choose wisely. The DJ can be considered “The Entertainment Director”. A common misconception is that the DJ is just “the music”, but in reality, the DJ must perform several duties. The key to a smooth wedding reception is all in the details and planning. There are DJs out there that do not understand the importance of being properly prepared. They go out there as “just music” and run into problems. For over 25 years, Rusty Bowers Entertainment has helped hundreds of happy couples create unique, memorable and fun celebrations. You can use my experience to help you plan your reception, and since I have seen many different situations, I can advise you as to whether something may work or not and why. I offer completely personalized, custom wedding entertainment. No two weddings are alike, and I can design a program to fit most budgets. I invite you to read this insightful article by Stacie Tamaki on hiring wedding entertainment. Music is the soundtrack for a wedding reception. It can help create energy, romance, fun, elegance, excitement and a number of other emotions. The “tone” can be set by the music choice and styles, transition, and building of energy. However, is music alone all it takes? Beyond just music, it takes a professional “Master of Ceremony” to effectively guide, direct, and inform the audience and create the overall “tone” for the event. That individual has the ability to dramatically impact an event and make it a success or failure. Even with great music, a bad MC can set the WRONG tone for an event. How many times have you been to a wedding and heard someone on a microphone shout loud and fast and no one understands what is going on? Maybe they come across like a sports announcer or a club jock? Even worse, what if they talk too low and frequently use repetitive phrases, or say “ummm”, “errr” and “ahhh” all night long? How will that impact the perception guests have at the event? How will the guests react? Will they feel engaged or bored? Are they committed to staying the entire night? Will they talk about the “overall” day as a positive experience? An MC/DJ does more than push play on a CD player. The individual will be the spokesperson for the entire group and the way guests will decide if they will have a great evening or not. Anyone planning a wedding celebration should ask themselves, “Do I just need music” or “Do I need someone to be a Master of Ceremony and direct my event”. If the goal is having ONLY cool music, then honestly why not simply rent a jukebox or use an ipod? It’s certainly safer and more affordable. However, if the goal is to create a fun and engaging evening that will offer a great memory for everyone involved, the more effective solution is to find a professionally trained Master of Ceremonies, Event Planner, and DJ that can work to help produce the intended result. *statistics published in St. Louis Bride & Groom Magazine in 2003. Sources include: Simmons, 2001; USA Today, 2002; National Bridal Service, 2001; The Knot, 2002; Brides Magazine, 2001. Let’s face it, having the right music and entertainment is only one of the major keys to making your reception successful and fun. I’ve been a professional DJ and Master of Ceremonies for over 25 years and in that time have helped hundreds of couples achieve amazing results with their wedding receptions. My professional experience began as an actor in Summer Stock Theatre, after that I worked for a number of years for Walt Disney World. My services are highly sought after for my expertise in entertaining, proper music programming, and timing. I am NOT a “cookie cutter” DJ company with many many DJs to book. 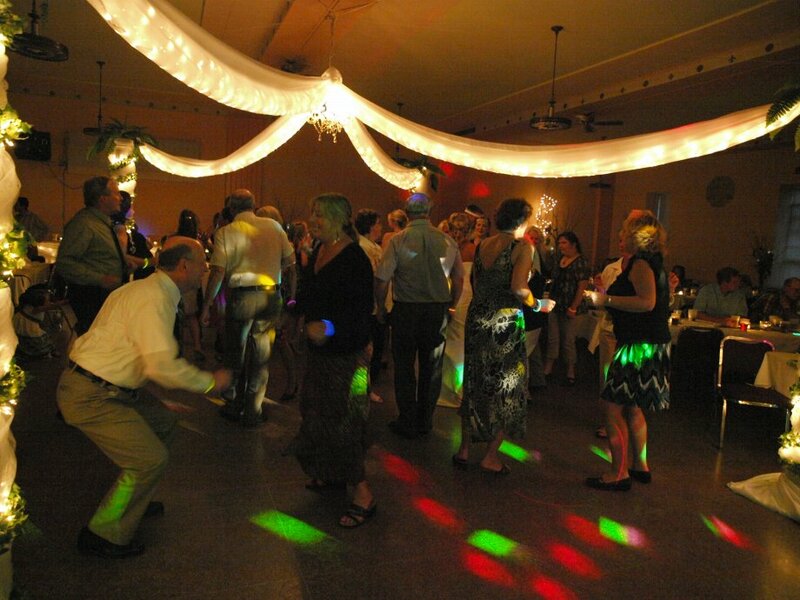 What I offer is HIGHLY PERSONALIZED, UNIQUE & UNFORGETTABLY FUN Wedding Receptions. “Rusty, You got and kept people out on the dance floor the entire night. I heard about the good time everyone had for months afterward. Power Reason #1: THE MOST EXPERIENCED, PROFESSIONAL PERFORMANCE. 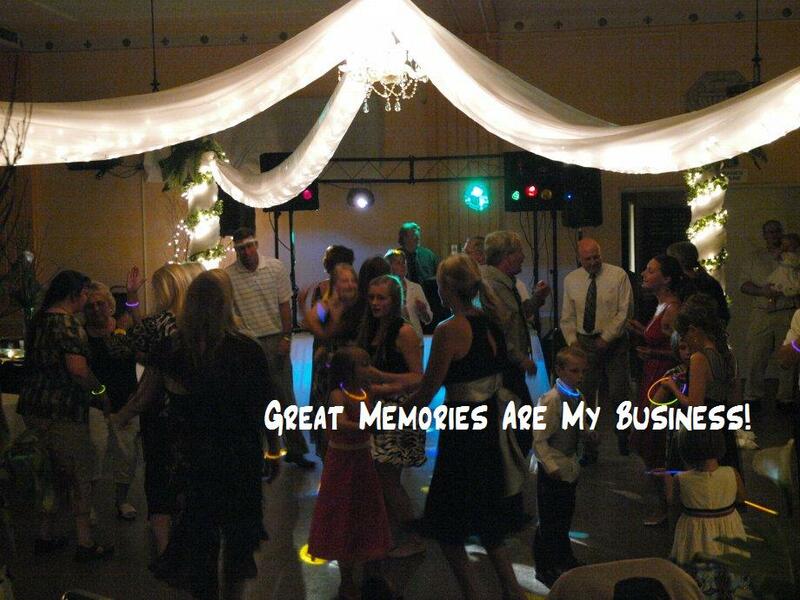 For over 25 years, I have helped hundreds of happy couples create amazing, fun, and unforgettable wedding receptions. I have tons of references, and over 95% of my business comes from referrals. Power Reason #2: YOU ALWAYS WORK WITH THE OWNER. And that’s important! Your wedding gets the 100% attention it deserves, and I am extremely accessible by phone and email. If I am not out performing, you will always reach me, and if I am busy, you will hear back from me within minutes of your call. This is how a DJ company should be run. The benefits of working with an owner operated company are unmatched. When it is my name out there, you know you will get the best performance. Everything from the preparation and performance, to the sound and care of the equipment is first class. Power Reason #3: THE MOST COMPLETE PLANNING SERVICE. From our initial meeting to the finalization of the timeline, I take care of every party detail, so you are free to enjoy every moment of your special day. I work with you and your other vendors to create a seamless timeline, assuring that your reception runs smooth and stress-free. Consider me your Entertainment Director. Power Reason #4: ORIGINAL AND FUN IDEAS. I specialize in creating highly personalized and unique wedding receptions that reflect your style. I listen to your requests, and share some of my original ideas that will make your reception unique. These special touches are only available with Rusty Bowers Entertainment. Power Reason #5: MORE THAN JUST MUSIC!. Not only do I have the best music collection on the planet, if you want to learn the latest dance craze or create some new ones, I can do that too! I am also in constant contact with your photographer and videographer so they don’t miss a single memorable moment. Power Reason #6: THE BEST SOUND AND LIGHTS, BACKUP EQUIPMENT. As owner, I take great care and pride in my sound and lighting systems. Although my unique talents, expertise, and musical abilities come first, my professional pieces of equipment are the tools I use to perform with. I use only the most reliable, professional, and state-of-the-art gear available. Backup equipment is built into each system assuring a seamless, trouble-free performance every time. Power Reason #7: EXPERIENCE, EXPERIENCE, EXPERIENCE. I got my start as a DJ at a dance bar in Marquette called The Alibi. Since then, I have worked in many areas of the entertainment field., including acting and singing in Theatre, appearing in several regional television commercials, Voice Over artist and Program Director in radio as well as perform for three years at the Magic Kingdom at Walt Disney World in Orlando, FL. My professional experience will assure your Wedding Reception will be Unforgettable, Romantic and most-of-all... FUN! Okay, Rusty. Everything sounds great! So what do we do next? When I say it is an honor and privilege to help you on your special day, I mean it. please call me now at 906-22R-USTY (906-227-8789). P.S. Due to my busy performance schedule, prime dates fill quickly. Although I can sometimes schedule dates at the last minute, to avoid being disappointed it is best to contact me four to twelve months before the date of your event.